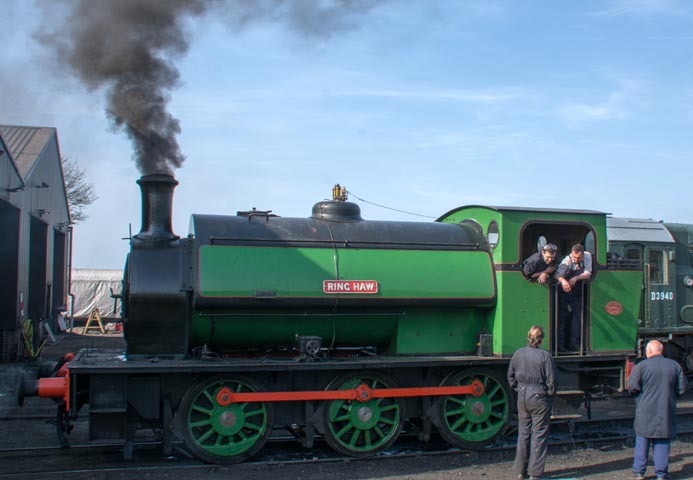 0-6-0ST Ring Haw was on shed Weybourne on all Saturday 21st April 2018. This locomotive was being got ready for the Sunday with the fire ony just getting going as 90775 had failed and was put in the shed later on Saturday. 2-10-0 90775 waiting to go into Weybourne shed having failed and was cooling down ready for its repairs. WD 2-10-0 90775 was built at Glasgow in 1943 for the Ministry of Supply. The Locomotive was built fot the War and was sent abroad just after. it never worked on British Railways. The locomotive was repatriated for preservation in 1984 The Locomotive was given the number 90775,one more than the last British Railways engine of the same design that had the numbere 90774. As this locomotive never had a British Railways number. It was not in the UK when BR steam was running so was never given a number. WD 2-10-0 90775 has been on the North Norfolk Railway since 2003.It has Just had a overhaul so it a pity it was not running.